Ritelite (Systems) Limited, based in Stamford, Lincolnshire, are a leading manufacturer of innovative, mobile and portable industrial work light solutions designed to meet the specific demands of the Hire Industry. At this years Executive Hire Show Ritelite will be officially launching the new MK2 version of their innovative and highly successful range of K50 & K65 Mobile Lighting Towers. Already successfully in use with Hire and Construction companies around the world, the K50 & K65 have been designed specifically to meet the unique requirements of Hire customers. 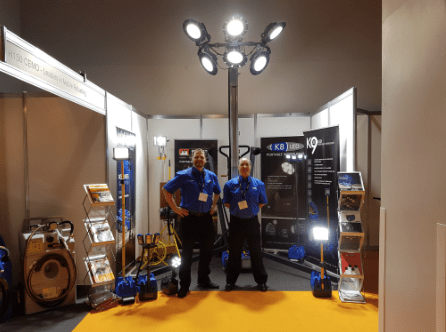 The special demands of the Hire sector require unique solutions from equipment manufacturers, none more so than for mobile lighting equipment. The potential applications for mobile lighting towers are wide ranging and diverse. From construction sites to outdoor sporting events, each application has its own specific requirements regarding the type of light projection required, power sources available, access to the site and placement of the towers. Many applications including outdoor sports events take place on surfaces which must be protected from damage. Vehicle access may be restricted or prohibited meaning that traditional solutions including road towable lighting towers cannot be used. Flexible product solutions covering the widest possible range of applications can significantly increase the user base, frequency of hire and as a result, increase the total earning revenue of the product, all of which means a quicker and higher return on investment for the Hire company. The amount of equipment needed within the hire fleet can also be optimised, reducing overall investment costs, stock costs and maintenance costs. Manufactured by Ritelite in the UK, the K50 and K65 Portable Lighting Towers provide the ideal Hire Fleet solution for powerful, flexible and highly mobile lighting towers which can be used in just about any situation. Two models are currently available: the K50 with a working height of 5m and the K65 with 6.5m. Both models are available with a range of metal halide or high power energy saving LED light heads which can be configured to provide an optimised light output according to specific user applications. The K50 & K65 feature a rapid one person deployment system, reducing handling and set-up / break-down times to a minimum. All models can be deployed by one person in less than 2 minutes. The innovative and compact design optimises handling whilst also minimizing space claim for storage and transport. In rough terrain applications, where access to site is restricted, or prevention of ground damage is critical, the built-in folding wheels with optional low pressure tyres allow the K50 & K65 lighting towers to be quickly and easily moved into position by one person. The Flexible power options enable the K50 & K65 to be used almost anywhere. Forklift pockets, which in addition to the existing lifting eye, increase versatility and speed of loading/unloading operations. Double automatic security locking pins on each mast section for increased safety. Slack rope safety protection system to prevent the winch from being operated in an unsafe condition. New high power 200w LED heads with configurable lens options to optimize light output in a wider range of applications.